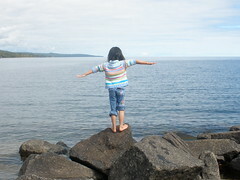 We stayed close to the rental home on Thursday so everyone could rest and enjoy Lake Superior. 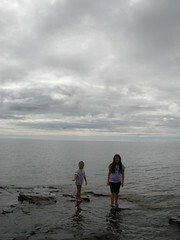 In the afternoon, I took the girls to Artist’s Point (in Grand Marais). Despite the cold temperature of the lake, they took their shoes and socks off; and played in the water. They collected rocks and found feathers – all interesting items to add to the nature table back home. The picture to the right is at a beach that is facing east (towards Canada). After playing here for a bit, the girls put their shoes on and we headed back to Artist’s Point. 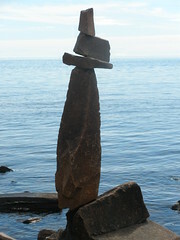 I’m not sure how these rocks are balancing on one another. Back at the Illahee (the rental home), the girls played in Lake Superior some more.